The Port of Brownsville, Texas, recently celebrated the completion of a 600-foot marine cargo dock and storage yard, the first new cargo facility at the port in 16 years. 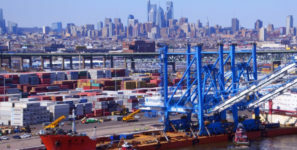 Dock 16 will also serve as Brownsville’s second heavy-load capacity dock and increase efficiencies “by eliminating or minimizing potential vessel delays,” the port said. Its 600-foot long, heavy load dock can accommodate cargo vessels with a draft of up to 39.5 feet. The work to build Dock 16 was partially funded by a $12 million U.S. Department of Transportation Transportation Investment Generating Economic Recovery (TIGER) grant. The port contributed the remainder of the funds for the $26.2 million project. The funds were used to construct the general cargo dock, road improvements and lighting. In 2014, the niche Port of Brownsville moved a record 7.6 million metric tons of steel, aluminum, lumber, minerals, grains, gasoline, diesel and windmill components internationally. Located close to the U.S.-Mexico border in southeast Texas, Brownsville is the largest public port authority in the nation with 40,000 acres of land available for development and 13 general cargo docks, four oil docks, one liquid bulk docks and two bulk facilities. Brownsville is also the site of Foreign Trade Zone No. 62 which currently ranks as one of the busiest FTZs in the country. The zone encompasses the Port of Brownsville, Brownsville-South Padre Island International Airport, Valley International Airport, the Harlingen Industrial Park and Airpark, the NAFTA Industrial Park and the FINSA Industrial Park at Los Indios.